Dear Bloggers, it has been soooooooooo difficult to choose a second Spotlight. Since your are all so exceptionally talented and your work of art is just stunning. For the second Spotlight we wanted to concentrade on the 3D Project (since the first Spotlight has been from the 2D Section) It was hard - and ... but finally .... we found this case sui generis so unique, that we thouht this would be an excellent second Spotlight. Wow isn´t it amazing? Watch out the details and the work in progress on Cindy´s Blog. Once again we have a wonderful prize to give away! We are so happy to be able to tell you that lovely Tusia from the very well sorted online store MixedMediaPlace has once again generously given away a wonderful prize for our April challenge winner! 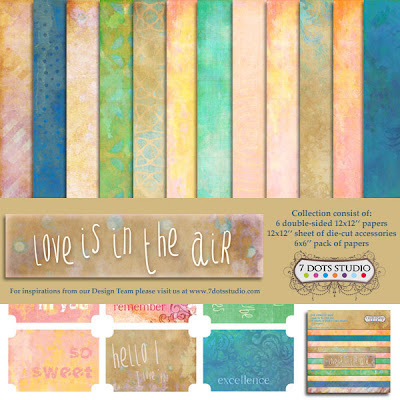 This time she donated the awesome "Love is in the Air"-Collection from 7Dots! Thank you so much for supporting our "challenge blog baby", Tusia! You really add that special "bling" to this challenge blog by sponsoring us! As usual the winner will be drawn randomly a few days after the challenge collection has closed. There are still 12 days left to enter a project with our challenge and maybe become the lucky winner! We would love to see your creations for this month's challenge! 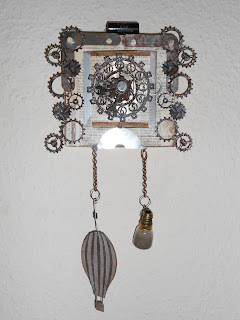 Two weeks has passed since the start of our second challenge "blend Fairytales wíth Steampunk" and we have already got such a lot of amazing entries! The actual April challenge is open till end of this month and you could still join in if you like. 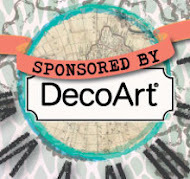 We would love to see your creations here! Time for our next spotlight! 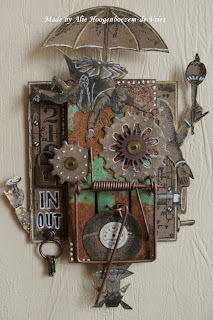 the colour combo is just amazing also the technique used, with the texture tread and stencil, Metal pieces.... - fantastic! Top3 and Prize Winner of Our First Challenge! Once again: WOW and a big THANK YOU SO MUCH for giving our challenge blog such an overwhelmingly wonderful start! Huge congrats, Ladies!!! So very very well done! (which counts for all who entered our challenge!) 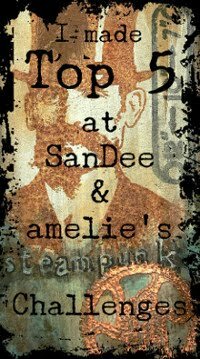 Please, feel free to grab the "Top3" badge from the sidebar to display it on your blogs! 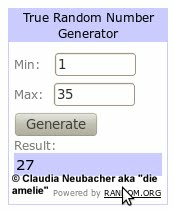 And there was a winner of a prize package for random.org to pick! 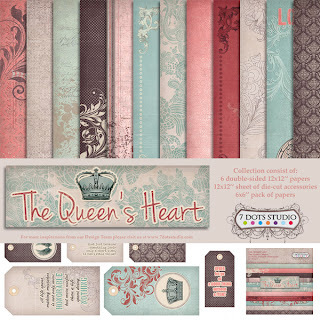 Tusia from Mixed Media Place was so generous to sponsor our challenge with the awesome "Queen's Heart Collection"! Congrats, Vee! Have fun with your prize! Please, contact us for further details (see side bar "contact"). 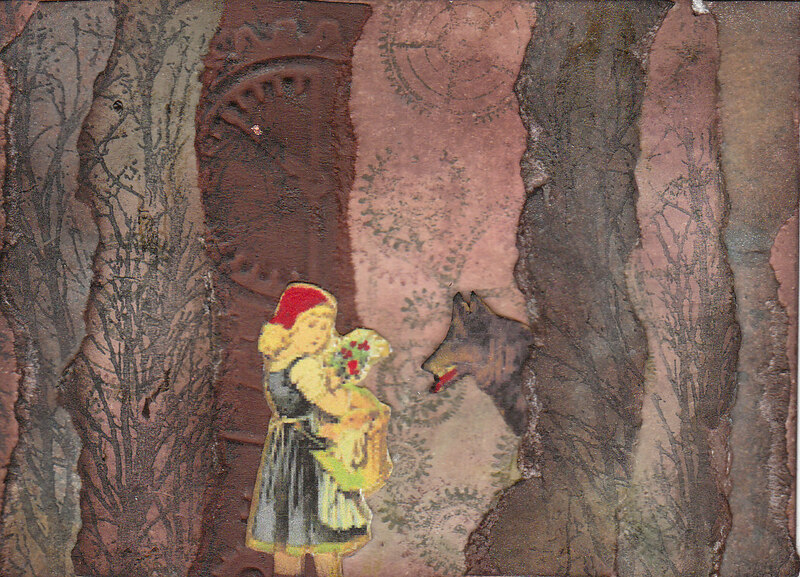 Our actual challenge "Fairytales in our Steampunk World" can be entered here! 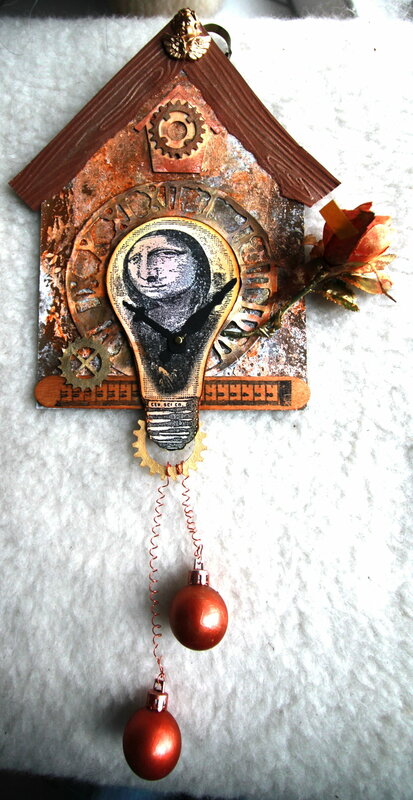 FAIRYTALES, into our Steampunk world. Imagine the tin man from The Wizard of Oz with a few more gauges and gadgets or Rumpelstiltskin in top hat and goggles or maybe Aladdin flying in an airship instead of on a magic carpet. 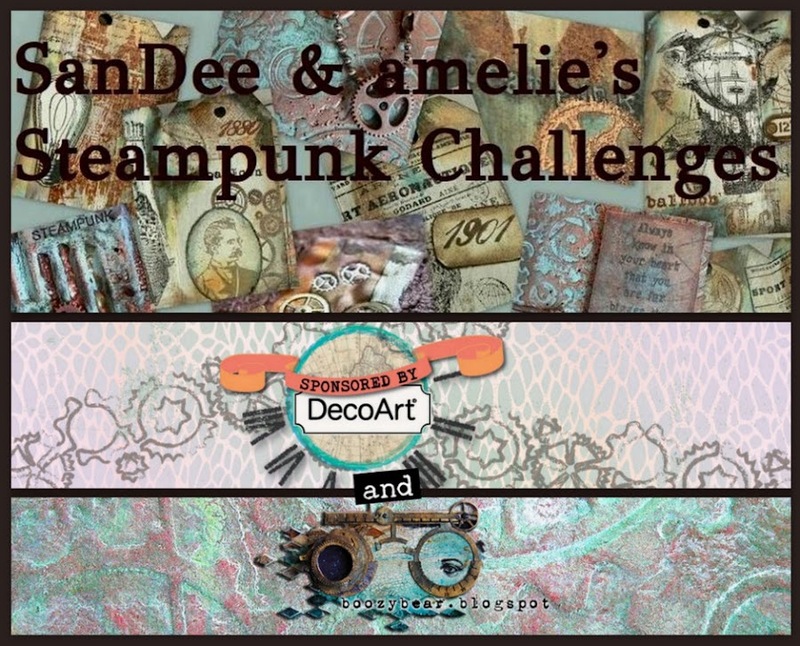 This challenge is all about creating fairytale characters with a steampunk flair. Let your creative imagination run wild! We can´t wait to see what you show us this time. We offer two separate inlinkz-collections for 2D and 3D/altered objects each. So the monthly Top3 will be chosen twice and the problem of the two categories not being comparable may be solved that way too - besides creating a much larger field for creativity. a warm welcome to MARK PERRY from UK. Follow his blog if you like to get a firework of inspiration - he is just such an amazing artist..
Watch out what he has created for our Challenge! WOW! Thank you Mark! Hi my name is Mark A.K.A The Male Crafter. I started crafting just over a year ago, although I have done arty kind of things for a while but never the amount of things I do now, thanks to AJ my partner ... now I cant get enough of it. Snow-white is still alive and well"
Hopefully you have seen sufficient inspiration to be in the mood to create something for our challenge and join in. We would love to see your projects with this month's challenge! The Top3 of each the 2D and 3D section for the "Cuckoo clock"-challenge and the prize winner will be announced in a few days. So check back to find out if you are the one!